I promise you this soup is so worth the 24 hour bone broth simmering! This past week I was hit hard with that pesky winter cold, and when I say hard I mean hard! I quite literally have not been this sick in over 3 years, it was a doozy! But no joke, Paul whipped up a batch of my bone broth and it has been my savour, whether you drink it warmed up on its own (yes like a morning cup of coffee) or you turn it into soup you will not regret it, especially if you are sick, but even if you aren’t a warming bowl of turkey/chicken soup always feels good! The ingredients you put in the soup can change to your liking, the main thing here is the broth! This is by far the best soup base broth I have ever had or made and literally it was mostly fridge scraps, so it is an awesome clean out the fridge kind of broth. The longer you let it simmer the deeper and richer it gets so I definitely suggest going for the 24 hour mark. Once it has simmered for the length of time I strain it into large glass jars and store it in the fridge. It also freezes well so if you made a whole lot, freeze it for a rainy soup day. Instead of straining the broth and making one large pot of soup with the whole thing, I like to make the soup as needed. That way you can also just drink the broth as is, if doing so, I like to warm it up on the stove, add an extra pinch of salt and pepper, a touch of turmeric and your morning or afternoon pick me up is ready. I like to make the soup as needed because I am not the biggest fan of veggies/noodles that have been sitting in broth overnight, they get mushy and personally kinda icky which is why I tend to keep broth handy, then reheat it and add soup veggies/pasta/rice, its fresher and the veggies won’t lose all their nutritional value. Its best to make this bone broth after a roast chicken or turkey dinner as then you have the bones all ready to go but you can go down to your local butcher and ask for some chicken bones/feet etc (they usually have some frozen) just roast them up at home until they are golden brown and throw those into your bone broth stock! I make the bone broth in the same pot/dutch oven that I roasted the chicken or turkey in and leave all those extra juices from the roast as they will make the broth even better! If you are using the carcass of a roast chicken or turkey, take all of the meat off the bones and place them back into the pot/Dutch oven you used to make your roast (if you are using bones from the butcher, roast them in the oven until they are golden brown before putting them in the stock). Fill the dutch oven with water and add in the rest of the broth ingredients. I usually take the skin off of the onions and garlic, and cut the onion into quarters. Break the celery in half and cut the carrots into 3rd’s. It is all just simmering together! Bring the water to a boil and then immediately down to a low simmer, place the lid on and keep on simmer overnight or for best results 24 hours. Once the broth has simmered for 24 hours you can drain the liquid into glass container, let cool and then keep in the fridge or freeze. 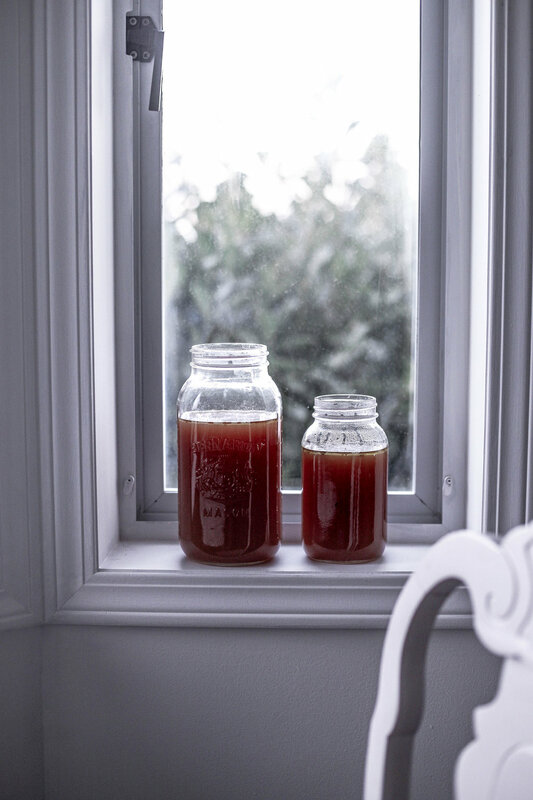 You can then make soup or even just drink by the glass, replacing your morning coffee with nourishing bone broth! In a small pot, on medium heat, add a splash of olive oil and a tsp of butter, chop up some leeks and add to the pot, stirring until browned. De-glaze with a splash of white wine, then add 6 cups of the broth. Bring to a boil and add your pasta noodles, if you roasted a chicken or turkey you can add some of that meat now as well. Once the noodles are half cooked add in some chopped carrot and celery. When the soup is almost done add in the broccoli (and cauliflower if using), simmer for another minute and serve immediately. Garnish with green onion, sesame seeds and roasted pumpkin seeds! Side note: I have made this soup many times without any pasta or meat, for a beautiful carb free veggie soup! I like to add cauliflower when not using pasta or meat.